What’s your favorite way to get at that last dollop of Crest? Do you flatten as you go? Slice the neck? What about the Palmolive liquid? Prop the bottle upside down? Add a little water and swirl? You are not alone. Booz & Co reports that 50% of consumers are trying to get the last drop of the products they buy in an upward trend since 2008. But not everyone is like me and likely you, seeing waste-hating as a chance to experience the thrill of the hunt, even in the quest to ‘save the planet’ or even a few pennies no matter how fast they can add up. Many people (obviously not readers of WeHateToWaste) will take their business elsewhere rather than spend precious time chasing after drips and drops. Sensing a massive business opportunity, brands, packaging suppliers, entrepreneurs and others are inventing new packages and gadgets to help consumers get all of their money’s worth from the products they buy. Are they worth the money and the resources they use up? Let’s discuss and debate. According to the scientific pounders and pummelers at Consumer Reports, up to 25% of the Lubriderm gets left behind as well as up to 16% of the Tide. That’s a lot of mayo, people — and money, too. As illustrated in the accompanying chart, that’s an estimated $1 – $2 on every bottle of Wisk, and a whopping $25 left behind on LaPrairie. Environment-wise, those drips and drops, like Tip O’Neill’s ‘billion here and billion there,’ add up to real impact when one takes into account the transportation and resulting emissions beyond the product and pack. As Waste-Hater in Chief, my life is a laboratory for every tip and trick to get the last drop of everything I buy. My eye wanders in supermarkets and superchic emporiums alike for new gadgets that can help me and the rest of our community save some bits and bucks with a little less elbow grease. Have you come across Oxo Good Grips’ new silicone spatula touted as specially shaped to reach the bottom edges and under the rims of jars of all shapes and sizes? Have you tried out Clorox’s new sprayer bottles for Windex with ‘Smart Tube Technology’ that evacuates up to 98% of product (versus 75% for conventional dip tubes) without the angling and other gymnastics? On the horizon for 2015: a coating called LiquiGlide that is reportedly getting ready to line packages of big name brands of toothpaste, mayo and paint. My mailbox is a magnet for new gadgets designed to pick up where package design leaves off. 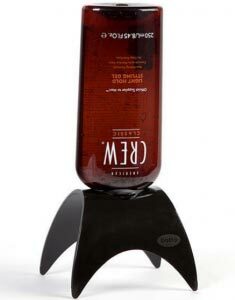 Two of the most recent arrivals including The Spatty, a tiny spatula that helps scoop out those last dabs of pricey creams and cosmetics (Check out inventor Cheryl’s Ridgon story). How Much Anti-Perspirant Are You Throwing Away? Gadgets are fun, but not always necessary. Sometimes all that’s needed is a little ingenuity to get at those nagging bits of goop left on the sides and bottoms of jars, bottles, tubs and tubes. Common household items within an arm’s reach of the kitchen or bath can do the rest. 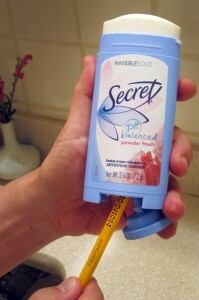 As some of you know, I for one proudly get at that last half inch of Secret antiperspirant that lies just out of reach with what I think is a quite artful jerry-rigged solution using a good ole Faber Castell pencil. Riches await the package designer who can help all consumers get that last half inch in a more elegant way. Ditto for other packages in need of an evacuation boost like round salt boxes, metal soup cans with the pull-top lids, and even some mayo bottles that are still not sufficiently squeezable to get the job done. Elodie Planche, blogger extraordinaire at LaVieEnGreen prefers to roll up from the bottom tubes of toothpaste, lotions and hair gels, and food items like mustard; even with kid products like glitter and paint, she starts at the bottom carefully working her way up. Her secret weapon is a round glass or rolling pin that ensures every drop of glop comes clean. Michelle Cashen (of iPhone case upcycling fame) recently referred me to this Toothpaste Squeezer now on sale at the Container Store. But even these may leave a pea-sized dollop or two. Slice the neck of a toothpaste tube to retrieve every last drop. Having firmly mastered the art of rolling, I recently tried a tip passed along to me from longstanding sustainability consultant Bill Russell (he should know, right? ), and sliced my Colgate tube at the neck. And voila! Much to my surprise, enough paste for another four days! Ingenious! And I’m not sure he’s even a Yankee. 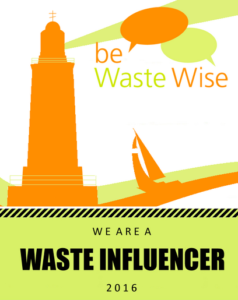 Note: The opinions expressed by contributors and those providing comments to WeHateToWaste.com are theirs alone, and do not reflect the opinions — or any endorsement by WeHateToWaste.com. While we have reviewed their content to make sure it complies with our Terms and Conditions, WeHateToWaste.com is not responsible for the accuracy of their information. Because consumers are more sensitive to changes in price than changes in package size, manufacturers that use technology like LiquiGlide or intelligent package redesign will downsize their package sizes while keeping the price the same, thus gaining a stealth price increase while claiming their product’s effective “yield” has increased for the consumer. I never thought to cut open the toothpaste tubes before – thanks for that idea. I’m almost looking forward to finishing my current tube to try it out! My mom was one of those resourceful types who didn’t need any gadgets. For example, she saved tiny last bits of soap and collected them in a thin mesh stocking, tying it off at the top. Then we had one giant ball of soap. I was so embarrassed by this unsightly stocking next to the sink but, looking back, it was quite ingenious. 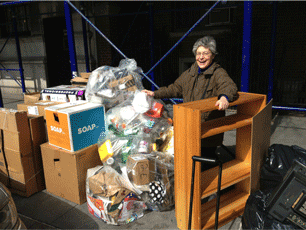 My old hall closet in Brooklyn was filled with half empty or nearly empty bottles of various care products. It seemed as if the pea-sized dollops kept reappearing. I thought that I could finally, at last, be done with these wobbly bottles, all turned upside down on their heads, but yet there was still product in there. Very irritating. I would have needed 20 My Bottos to accommodate the lot of them. Which brings me to the important point in question – gadgets. Isn’t this a sneaky way for us to consume more stuff? Yes, we are using up the last drop of one product, but now we have this other ‘thing’ taking up space. Also, the idea of ‘more plastic’ makes me cringe. Not to pick on My Botto, but the stands are made out of polypropylene, which is recyclable, HOWEVER it’s still NEW plastic. It seems wasteful to me. I’d much rather stick with a pencil to get at that antiperspirant or use my mom’s soap sock trick any day. Small book ends with enough weight to prop the product upside down could easily mimic My Botto. I vote ‘no’ on creating new products to use up other products. I’m with you, Jenny — and perhaps this provides a little bit of an explanation for anyone reading this, I intentionally put the slant on the article that I did because however exciting it is to see inventors, entrepreneurs etc. come to market with new gadgets that can help us all get those last drops, I have to wonder if all of them are necessary. (Spatulas excluded!) So, I opted to play provocateur and see if we could stir up some healthy debate about the merits of some of these gadgets and maybe point to some creative alternatives that used fewer resources. Certainly many of these gadgets would not be necessary if a) packages were designed to be completely emptied in the first place, b) all consumers were ingenious in finding ways to get those last drops, and c) more forums like this one existed to share our tips and tricks. 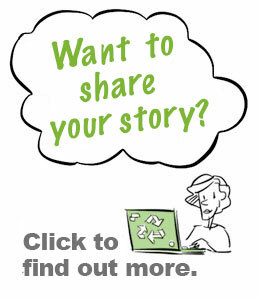 Pingback:	Sustainablog | Jeff McIntire-Strasburg has been blogging a greener world via sustainablog since 2003! I just thought of another aspect about “getting the last drop” that I don’t think has been mentioned yet. Not only should packaging be designed to enable consumers to get the last drop to avoid wasted product and dollars, but it is also important for recycling purposes. For example: you should not put a ketchup bottle in the recycling bin that still has ketchup all over the inside. 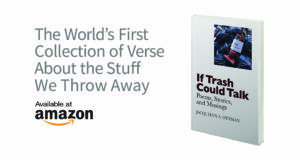 It should be clean before putting it out for recycling. If the packaging is deisgned to make it easier to get the last drop it will also be easier to recycle them. 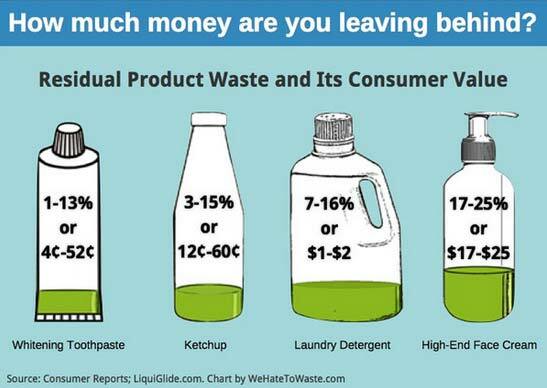 I know there are a lot of people who would sooner toss a ketchup bottle out than spend time cleaning it for recycling. Another great reason to promote use up rate is to gain competitive advantage: offering the consumer a package that enhances use up rate is the equivalent of running a ‘bonus pack’ — really necessary in commoditized markets. 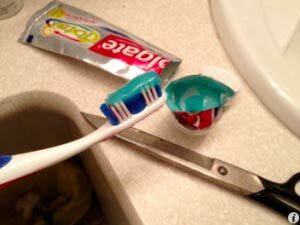 I like to squeeze as much use out of my products as I possibly can, too – and I can’t believe that I never tried cutting the toothpaste tube! It makes me nuts because in my family, there’s inevitably someone who will throw away the last four days worth of toothpaste, just because he can’t reach it. Great tips in here. Thanks! I’m with you, Ashley. 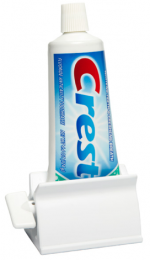 Don’t you wish that toothpaste tubes could be accessed from both ends? — Or maybe come with a perforation that makes it easy to access the toothpaste in the neck? Maybe as a start you can get your family member one of those keys. I’ve been a toothpaste tube neck cutter even since manufacturers switched to plastic and I do the same with all flexible tubes. There’s always so much left inside that I fold the top and use a binder clip so the product does not dry out between uses. Same with soap, I always stick that last thin piece onto a new bar because… why not? Talk about wasting perfectly good product! I totally agree with Jen on anti-waste gadgets, we have everything we need at home to fight waste and these only create more plastic waste. And I’m a child of the 70s when everyone discovered the luxury of… wasting as a collateral of growth! I just don’t get why we’d waste if we can so easily avoid to. A jar used to hold an upside down bottle works perfectly (padding with kitchen cloths will keep it straight if needed). Now from a manufacturer perspective, let’s keep in mind that the top decision drivers are price (keep packaging cheap) and design (must appeal to consumers to sell). The ability of a package to let all the product out is not a defining variable, quite the contrary. The more we can’t get to, the more gets in the trash, the sooner we buy a new pack, and that, is what companies want: accelerating our purchasing cycle. Things might be changing if consumers now put this on top of their priority list, but I am pretty sure companies won’t put their truly/honest efforts in designing the best no-waste packaging, at least not before they check the cost and design boxes. By then there’s probably no budget left! My first thought after reading this post was: we have to buy MORE products to use our CURRENT products?! I see that Jenny Abel and Jacquie Ottman agree that this is a problem. While I do not want to downplay the innovative and creative energy behind many of these gadgets, it worries me that so many people, especially in America, look for ‘quick fixes’ to solves their problems (on TV, we see everything for banana cases (not the things they hang from, but actual cases for your banana, to extremes like weight loss pills..). Things like the banana case and the MyBotto are good in theory, but that is only if people ACTUALLY USE THEM! This is my worry with many of the things mentioned in this post. 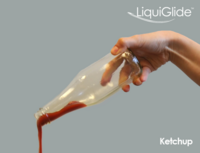 I think that innovative solutions to environmental problems can be very effective, and the ‘squeezable bottle’ by Heinz is a brilliant example. But I am wary of ‘quick fix’ solutions that require that people BUY MORE – also, this prevents people from coming up with creative solutions to solve these issues ON THEIR OWN, believing that they need to BUY something if they want to be sustainable, or that they can MAKE UP for their unsustainable purchases or habits by buying a nifty tool or gadget. I do really like the spatty, though, and I am considering buying one for my sister. I own the toothpaste gadget and absolutely love it, it actually does help get all of the toothpaste! However, I think that the packaging has a lot to do with the amount of the product that is wasted. Perhaps buying more isn’t always the solution – maybe it is the original product itself. Good news to all those here who are frustrated with the way product packaging does’t allow us to get the last drop: Swedish designers Hanna Billqvist and Anna Glansén have developed an ‘all natural’ superhydrophobic surface for plates and the interiors of bottles that results in particles just sliding right off it with gravity. Apparently, you just turn your plate to bottle upside down, and every last particle of food/product will slide right off the surface, no washing necessary. This obvious;y has huge incredible implications for being able to access 100% of our products, but also would have immense water savings if dishes never have to be washed! The idea is still in development but would be a waste haters dream if it comes true! And the bacteria slides off the plate too??? Never wash a plate that had salad with mayo on it? I’m not sure about that..
Yeah I think I will have to see it to believe it too! But apparently the water component of any food item will cause it to bead up and roll away. I hope they can deliver on their promises, would make meal times much easier and cleaner! Also, what about the manufacturing process (waste), possible effects on users (has it been tested for offgassing, migration, such as maybe possible with substances such as nanomaterials)and recycling/disposal after use. Ben makes a good point about the processes involved in creating, implementing, and even disposing of this new material. Not everything requires a technological fix, nor will there be a silver bullet. I think in terms of packaging, a designer often gets little input on how the product should be modeled, especially when working for established “caregiver” brands. Redesigning the packaging of a product is a reconstruction rather than a face-lift after all, and even the most efficiently designed packaging solutions can be scrapped in favor of a cheaper and a more brand-focused alternative. I do not believe it is the consumer’s obligation to cut open packages to get the last drop and in place of which, it is our wholehearted boycott of inefficiently packaged goods that will change the brandscape’s objectives. I place almost empty bottles upside down in a large mug or plastic glass – does the same thing as the “botto” and you probably already have one. Also let’s try and use just as much as we need to, to get the job done as my friend Anne reminds us. How little can we use to, wash the dishes, hair, clean teeth etc- often we are advised amounts to use far in excess of what is actually required to get the job done. And buying a bigger container to save plastic packaging and money, is only a bargain if we ACTUALLY use it all. Bargains can quickly turn into waste if we are not diligent!